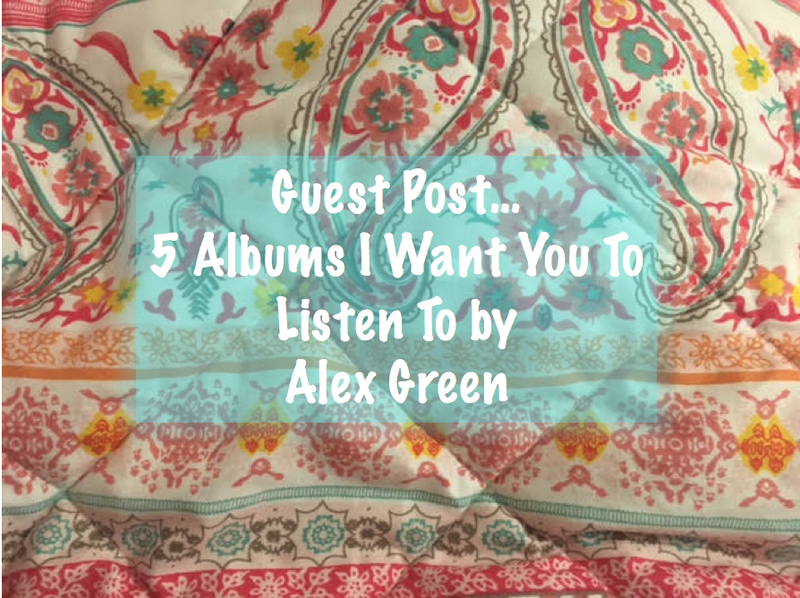 Alex: When I was first asked to write the guest post I thought about how I came to know our gracious host and that, for those who don’t know, is by presenting on student radio. Music! Why didn’t I think of that before? Truth be told, I’ve fell off the music wagon since graduating, falling more into my films and books but it’s something I’ve wanted to fix and lately I’ve eased back into some more. I’ve rediscovered old favourites and new loves, some of which appear on this list. Whilst presenting on the radio, I also did a podcast interviewing guests about their favourite albums. When I did my own choices, anyone could have guessed my albums as I never shut up about them. So, in this list I’ve tried to add some that might not be so stereotypical for me and hopefully some that will become your favourites too. One of my all time favourite albums and one of the best, if not the best of the 2000s, Norah Jones’ debut album is in simple terms, perfect. Mixing soft jazz, blues, pop and country, Come Away with Me is an album that one wishes would never stop. Jones’ vocals are stunning to say the least and she coolly invites you into every song as if she’s in the very same room as you. Jones is the daughter of sitar virtuoso and George Harrison’s close friend, Ravi Shankar but this album takes no inspiration from her father’s work as it cements her own voice and unique style. If you’re still not convinced, the album won 8 Grammy’s at the 2003 awards including Album of the Year and Song of the Year for ‘Don’t Know Why’. Notable songs to listen out for are ‘Don’t Know Why’, ‘Come Away with Me’, ‘Painter Song’ and the irresistible ‘Turn Me On,’ which is a song to rival Marvin Gaye’s Let’s Get it On and Etta James’ At Last, for the sexiest song ever written. This album is perfect. Please listen. This is Ol’ Blue Eyes like you’ve never heard him before. Completely stripped down, there’s no finger snapping, big bands or grand shows here, it’s just Frank singing the blues and it’s beautiful. That famous voice croons away and pulls at the heartstrings, sinking us all into his heartbreak for this is what this album is, a break-up album. It’s a lonely album about love gone wrong and is often considered one of the albums to truly fall under the LP label rather than just a collection of singles, it forming together to tell a complete story. Ranked amongst the best albums ever, this classic is perfect for when you’re in need of some blues. Because you can’t always have nice soft jazz and the blues. The ultimate rock album? Maybe. Some would agree, others chase me down the street with pitchforks. Whilst our Australian friends lacked the subtlety, lyrical prowess and musical invention of the likes of Led Zeppelin, Hendrix and Pink Floyd, they know one thing; how to write a rock song. They bring power to the song unmatched by most bands that are not only catchy and sometimes pop oriented but will have you head banging, air guitaring and pretty much making you think you can do anything you damn please. This album in particular features several of those songs. Obvious choices go to Back in Black, Shoot to Thrill and You Shook me all Night Long. I said before that everybody needs to listen to the blues and the same goes here. Sometimes, you absolutely need to let go, give zero fucks and listen to something really loud. This is the album to do it. Another hidden and I think underappreciated gem. Paramore are mostly given the Pop Punk tag, which is fine given their first three albums absolutely fell under that genre. With this fourth album though, the game changed completely, with the now new trio putting out this mix of pop, acoustic, rock, ukulele, gospel brilliance. This is the first album after founding members Josh and Zac Farro left the band, leaving lead singer and original member Hayley Williams completely in charge. Overall, this album is a breath of fresh air for anyone who has suffered some pain and is now on the up, appreciating life for everything it is. It’s hopeful, full of love and has catchy and dance-y songs front to back. A really brilliant story when you think about the complete style change from previous albums. Notable listens include Last Hope, a song which tells us that it’s no good to worry because good things will come, just hang in there. It’s beautiful and my favourite on the album. Still Into You as well is a standout as well as the three ukulele interludes, as well as Be Alone, Ain’t it Fun and (One of those) Crazy Girls. Cool summer evenings. Drinking with friends. Dancing in the dark drunk and uncaring. These are just a few of the things this album brings to mind. This album is just FUN. Though its main strength lies in Side A, the record as a complete work flows extremely nicely and is often one I listen to when I want to relax or need something chill on. A great mix of pop, synth and soft rock, Phoenix really give us something special here. It’s not too long, coming in at just over half an hour and so is easily digested over and over. Eat it up; it’ll be like summer before it’s even here. Look out for Lisztomania, 1901 and Love like a Sunset Part One and Two. I hope you find some songs that you can connect to on this list and that some, if not all, of these album's make it into you new playlist/record collection. Want to tell me about your favourite things? Get in touch! The actual picture after that reduce towards the second replica watches as well as Morris reached Fieldmont college. Prior gossips stating how the Moving Gemstones is going to be leaving behind using their content hublot replica uk happens to be accurate following the most recent reviews verified how the experienced rockers possess authorized the cope with common Songs. The long run contract provides the tag heuer replica sale the actual privileges to take care of the actual rolex replica uk such as it's electronic discharge. Credit reporting this news the organization stated, common Group will start preparing a good unparalleled, long-term marketing campaign in order to reposition the actual replica watches sale catalog for that electronic grow older. At the same time exposing their own exhilaration using the offer the actual replica watches sale mentioned, common tend to be ahead considering, innovative as well as on the job songs individuals, All of us truly anticipate dealing with all of them.